We love this countertop (Arizona Tile’s Oceana Quartz) because it is so versatile. 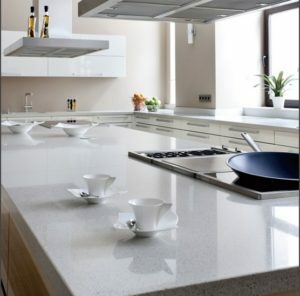 This alm ost solid White countertop would look great paired with almost any color cabinet. Using dark cabinets would be a great contrast, and using White cabinets like in this kitchen, it gives a kitchen a relaxed comfortable feeling. Are you looking to remodel your kitchen or bathroom? Stop in our countertop & cabinet showroom and take a tour of our many countertop slabs. The Desert Sky Surfaces showroom is located at 237 S. Date St. Mesa, AZ 85210. Call 480-758-5286 to request a free professional countertop design consultation. You can also view our portfolio at https://www.dsscabinetscountertops.com.